These are real bonus finds when picking golden chanterelles. Color is very similar to chanterelles, orange, like a hunter's blaze orange outfit. When you find a bunch of chanterelles sometimes these hedgehogs will be nearby. Sometimes while checking out a patch of blaze orange mushrooms that is seen in the distance you will find out that they are hedgehogs instead of chanterelles. In the case of these mushrooms it is a great find. In dry weather or when a bit mature, or both, the bright blaze orange color will fade some appearing as a washed out hunter's outfit, almost a chamois leather hue. Because of these teeth the group itself is usually easy to identify. 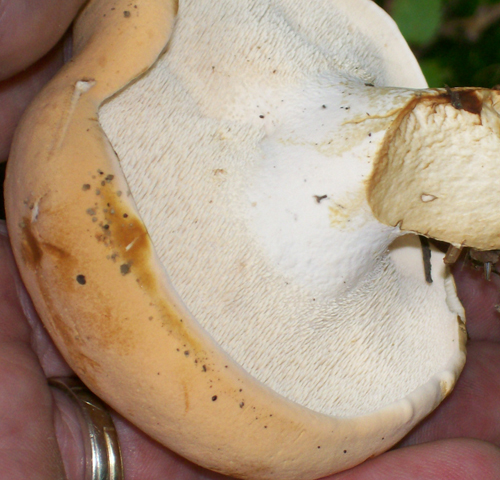 Note the brown bruises in the photos - one of the identification characteristics. Injured, bruised or cut areas will turn brownish. Flesh is whitish. This cut-in-half sample shows the flesh, the spines and injured areas. A great characteristic of these hedgehogs is that they are a solid sturdy mushroom. They are a bit brittle however. Where most mushrooms would bend a bit the hedgehog will break. Grab a bit of the cap margin and you can break it like a cookie. There is very little waste in the cleaning. Brush off the dirt, they can take some abuse. 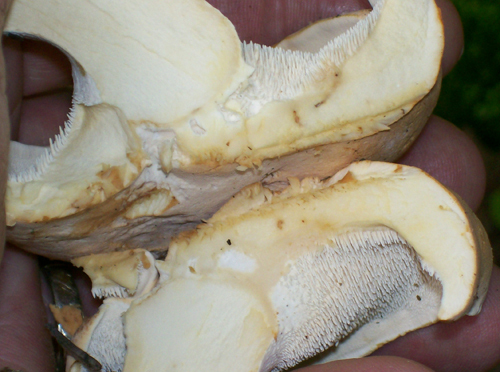 Hedgehogs can take the form of a regular mushroom cap or have a wavy margin and be irregular. Also, they can have a stalk in the center, directly under the cap like this one. Most often the stalk will be off to the side, like the lower photo. Here is one being held so you can get an idea of the size. 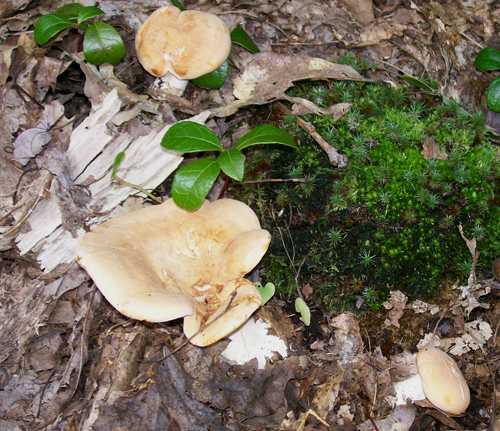 The hedgehog is not a large mushroom, at least not those found in southwestern Pennsylvania. If you find 6 inch cap spans you are finding good sized ones. 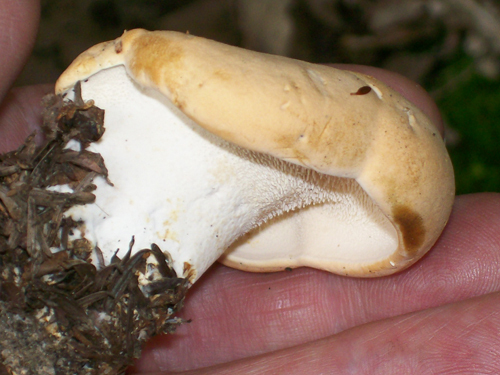 Taste is similar to the golden chanterelle. If you like chanterelles you will love these. Plus they grow in similar habitats. 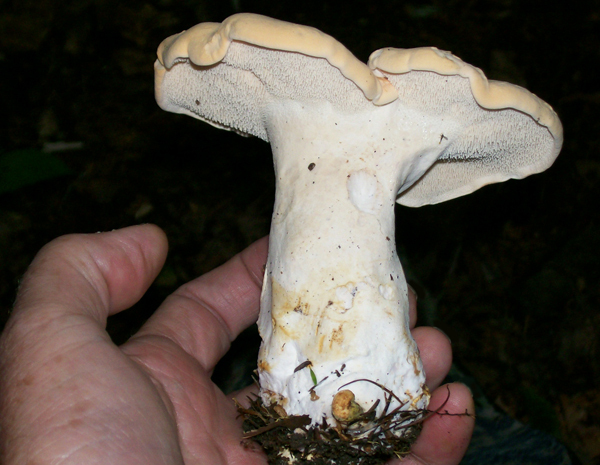 I have found these in hardwood forests with oak and lots of beech. I have also found them in pine needle duff. Here is a batch of delectable collectible edibles fit for a king. 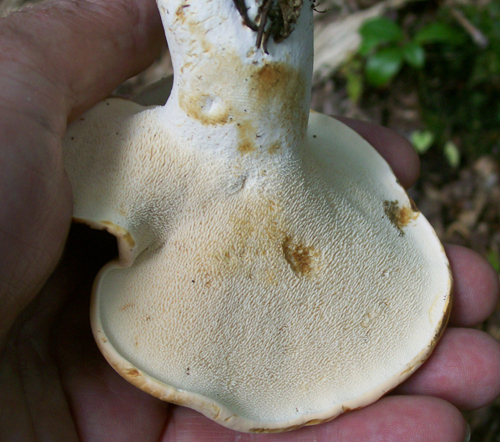 Dentinum repandum / Hydnum repandum - A/K/A - Hedgehog, Sweet Tooth. DATE - August 14, 2010. 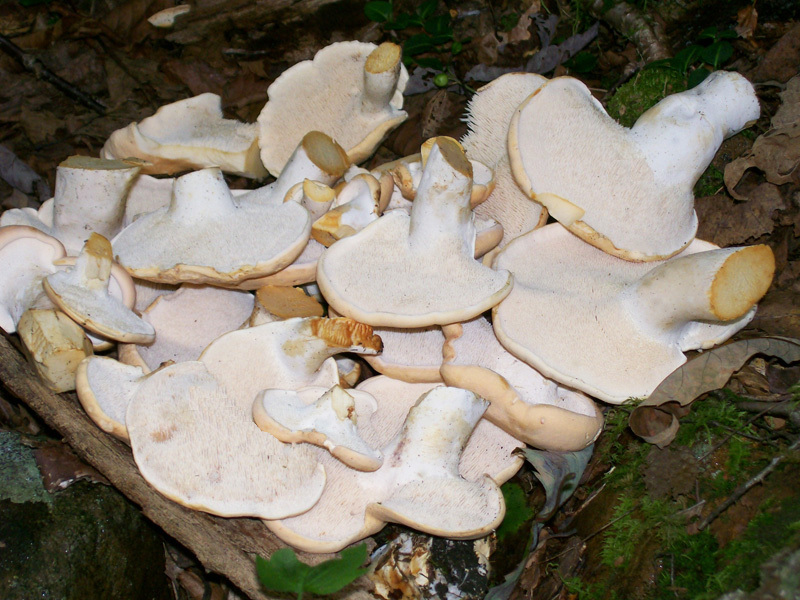 FOUND - 'Allegheny National Forest' - Forest County - growing in pine woods. Also Laurel Hill State Park and Kooser State Park from mid July through mid September in mixed hardwoods, depending on weather. Weather conditions were dry for several days. Generally the season has been dry during the end of July and Early August. The particular area in Forest County however is usually very dark and stays a bit more damp than most due to the thick pine tree canopy.